Get ready to bag your self some serious arm candy. From block coloured totes to butterfly clutches, these are the hero bags you need to know about now! Accessories are having a moment this summer. The clothes may be minimal and monochrome with touches of Orient thrown in, but bags are going groovy. The It bag has returned this season, but this time it’s a minimal, pared back design with almost logo-less details. Easily the most copied bag by the high street this season is the Celine tote – it’s on everyone’s list at Team MC. Block panel colours and a large oversized shape as seen at Fendi with their ‘Geometric 2Jour’ bag and 3.1 Philip Lim give you the sporty look. If you are after a more ladylike shape try the pastel shades at Mulberry. If the monochrome mod look head-to-toe, as seen at Louis Vuitton, is a step too far, fear not, instead rock the S/S13 trend with a geometric print beauty on your arm. This Moschino Cheap and Chic woven bag ticks the trend. Marni, Marc by Marc Jacobs and Fendi have also all cornered the structured, graphic, checked bag. Look for a sharp boxy shapes and bold colourful checks. Take a bold approach and embrace the plastic and perspex trend, which filtered down to the accessories at many of the big labels. We heart the ‘Blaze’ bag from Burberry, but Gucci, Valentino and Charlotte Olympia also had perspex beauties in their collections. A winner for both day and night, just make sure you’re phone/wallet/lipstick is looking extra pretty as it will be out for all the world to see! The 70’s shoulder bag: chic enough for the office but equally looks fabulous on the weekend when you’re lounging around at Shoreditch House. Meet the ultimate day bag. If you’re a sucker for a compartment, then Chloe’s ‘Amelia’ bag is the style for you. Note the durdgy colours to pump up the 70’s look. If you’re after a little light-hearted fun, then look no further than the spring/summer catwalks. From butterflies to bricks, bring on the statement piece. The Lanvin perfume bottle is the perfect night time clutch, while Valentino’s diddy butterfly shape works teamed with a whimsical flirty dress for a wedding. The key thing to take from this trend is the shape, it’s very much go small or go home for summer 2013. 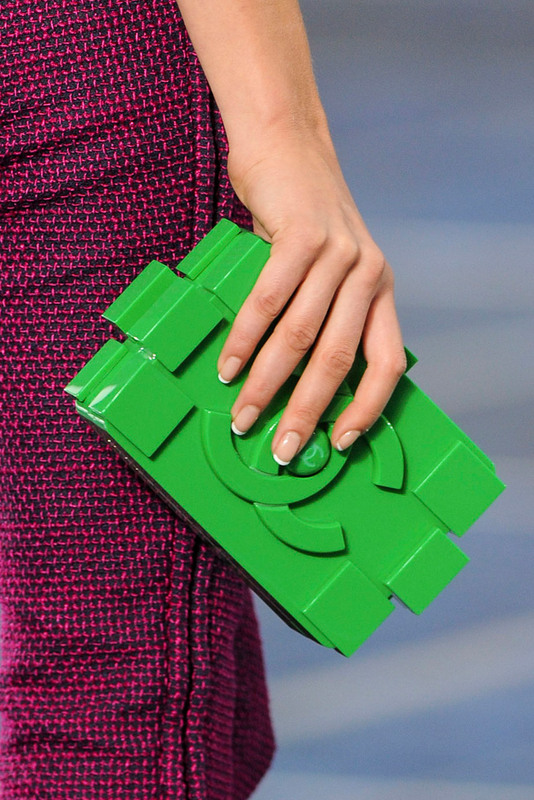 The celeb favourite, Chanel’s ‘Boy Brick’ clutch, must be mentioned. It’s been seen on everyone from Kim Kardashian to Anna Della Russo, follow their lead for a snip at £5800. Gulp.